Known for its vibrant nightlife atmosphere and fresh, high-quality food, Sapporo also has a dramatic exterior framed by giant torches, lighting up the Scottsdale sky. The interior is equally dramatic and includes an elegant elliptical bar where the passion-mango martini is a local favorite. The restaurant’s menu includes a variety of premium sushi and Teppanyaki as well as classic and contemporary Asian specialties, such as Grilled Black Cod glazed in Miso, delicately fried Tempura, and even a spicy version of Hawaiian poki. 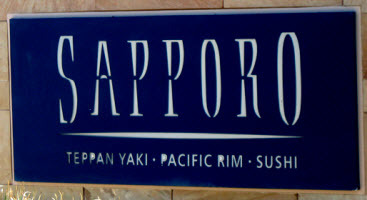 Additionally, Sapporo’s popular Happy Hour specials highlight the restaurant’s creative cocktail menu and is available seven days a week from 3–7pm in the lounge and on the patio.